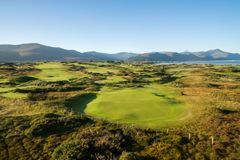 Golf has been played on the magnificent Dooks turf since 1889, and there are few more spectacular places to visit. Set across three sand dunes at the head of the idyllic Dingle Bay, Dooks is a charming links course, whose rugged character is off-set by the stunning scenery that surrounds; across the bay are the towering Slieve Mish and Dingle mountains. The development here has been steady, with the second loop added in 1970 to the original nine holes, and in recent years the distinguished Martin Hawtree has been commissioned to enhance the existing layout. The result is superb, and every visitor to Dooks will undoubtedly be impressed. In the same fashion as many of the other traditional Irish seaside courses, the attraction of Dooks is that it has not been worked too hard; the greens and the teeing areas have been placed where the land dictated, and as a result the feel is incredibly natural. The comforts of the clubhouse and the beauty of the setting merely add to the incredible charm of Dooks, an essential stop on the south-west trail. Good style muni course. Not a classis links course but fun to play. Fairways needed some water (unusal for Ireland). Overall a fun course to play.